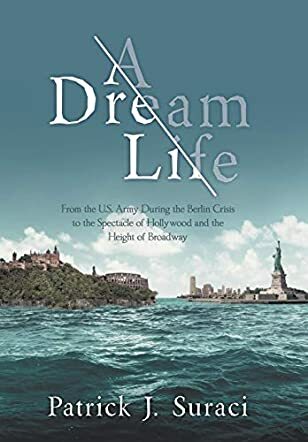 A Dream Life: From the U.S. Army During the Berlin Crisis to the Spectacle of Hollywood and the Height of Broadway is an LGBTQ novel written by Patrick J. Suraci. When Philip Greco was called up for military service, the priest at Saint Malachy’s Actors’ Chapel in Manhattan urged that he discuss his sexual orientation with the army psychiatrist. The stresses of living in close quarters with all those men would be difficult and could end up being dangerous. Philip didn’t want to risk having that record hanging over him for the rest of his life, however, and he had assured the priest that he would do just fine. Basic training was challenging enough, but active service proved to be even more difficult, especially for the actor who had been living in the relatively permissive society of New York City’s theatrical life. Now, any hint of his homosexuality could lead to prison time, and the specter of Fort Leavenworth’s maximum security facility loomed stark and terrifying over him. While he did make friends, including some who seemed to be on the same wavelength, there was always that hesitation, that need for caution. A Dream Life is a fascinating story about an actor turned court-martial typist in the army and his experiences while stationed in Germany. Suraci’s characters are authentic and well defined, and seeing them against the historical backdrop in which the story is told is marvelous indeed. I particularly enjoyed seeing Europe through Philip's and John’s eyes. While this book contains episodes of romantic eroticism between men, those scenes are beautifully and respectfully written. Readers may often find this book to be a somber reminder of the difficulties faced by homosexuals particularly those in active service in the 1990s. This well-written and thought-provoking book is most highly recommended.